My name is Zoku! I am an ADORABLE, SUPER PLAYFUL, one year old, short hair, grey (spayed) female tabby who happens to have only 3 legs. I survived a very frightening attack by a dog which resulted in losing my right front leg, but I am fully recovered and doing GREAT NOW! I am SO GRATEFUL to be enjoying time in a loving foster home until I can find my new permanent home! My foster Mom says I am AMAZING! I am well behaved, love to run and play, and snuggle up with you! I even get along well with other nice cats and a relaxed, quiet dog in my foster home. I would be SO HAPPY to find a loving family to grow up with me! Zoku is AMAZING! She gets around just fine on her 3 legs and can run up and down our stairs faster than ever. She is VERY FRIENDLY and LOVES attention. At first I did not think she liked other cats, but now that she has settled in, she roams the house freely with our other cats and gets along very well. She has become best buddies with our feral cat, Poppy. She even gets along very well with our relaxed dog, Jason. Zoku should be fine in a new home with another cat or quiet dog as long as she has time to adjust to them. 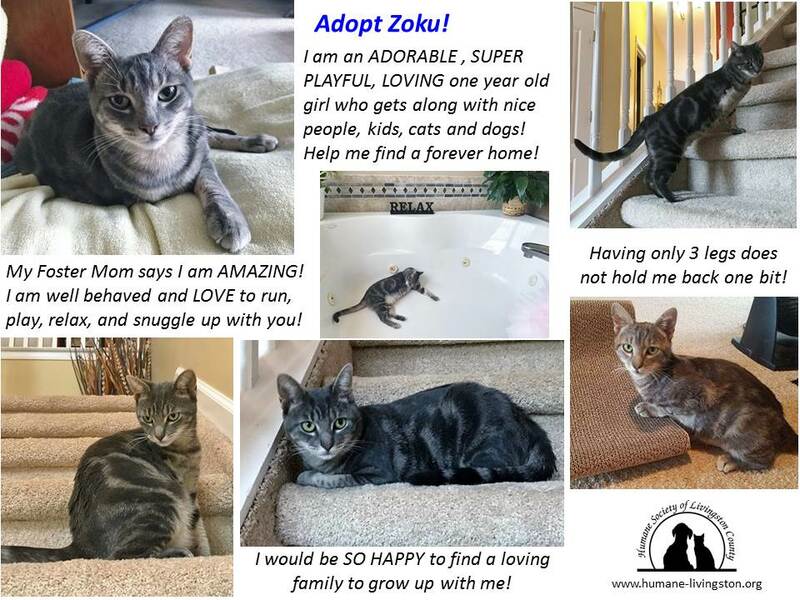 Zoku LOVES to play and has her own special scratching pad that she loves. She eats well and never has gone outside the litter box. She is a SNUGGLER and sleeps on my bed at night along with my dog and other cats. She loves to sit in the windows and look outside. She is ADORABLE and would make an amazing pet for a loving family!